Home > Events > Concerts > Vaastu shastra Class , learn Real ……..Not Modern. Vaastu shastra Class , learn Real ……..Not Modern. 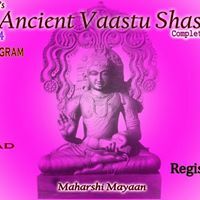 You will be an Vedic Architect ,after learning the technical points in Maharshi Mayaan’s Ancient Vaastu Shastra . Follow the Real Vaastu knowledge , Not Modern Vaastu shastra . This entry was posted in Concerts, Events on September 30, 2014 by Aapnu Amdavad.